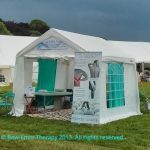 We love hearing from happy clients about how the EMMETT Technique has improved their quality of life, however, the EMMETT Technique DOES NOT claim to treat illnesses, diseases, syndromes or medical conditions. It may help relax areas of tension and allow the area of the body treated to feel lighter and easier. All client stories are in their own words and are published here with their permission. Each person is unique and may have their own individual responses. We were invited to help man the Emmett Technique UK stand and I was generously given two video comments from CAMExpo 2016 after quick demonstrations of Emmett Technique, thank you ladies for trying out Emmett Technique.